To begin, enter keywords in the search box in the online catalog. Set the pull-down box to left to "All fields" in order to retrieve keyword results. 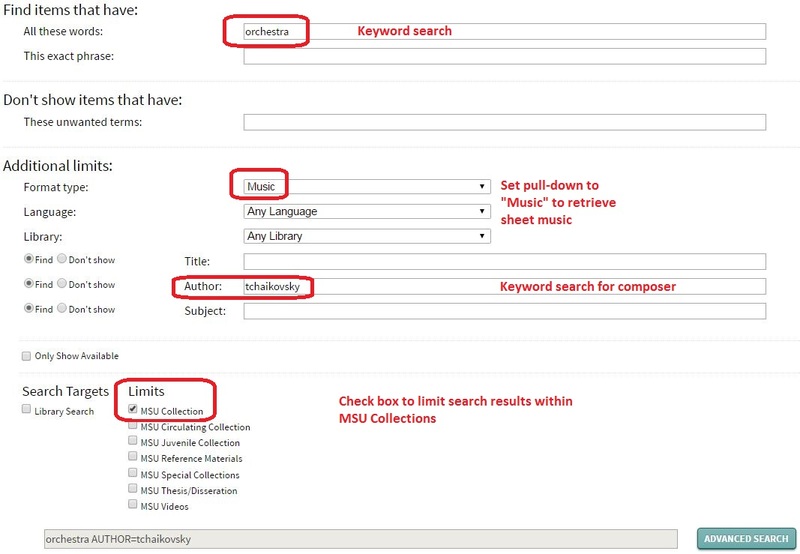 Set pull-down box at the far left to "MSU Collection" to limit search results to items only available at MSU. To further limit search results, check the boxes along the left-side to check which elements to include or exclude from your results. Do not include common grammatical conjunctions like "and", "or", "in", "of", in your search. AND is assumed when searching a string of keywords together. Use the truncation symbol * at the end of a term to search for all variant spellings. For example, pian* finds piano, pianist, pianism, etc. It is best to place the * as further to the end of a word as possible to retrieve narrower results. Use quotation marks around keywords to retrieve results with the exact phrase. 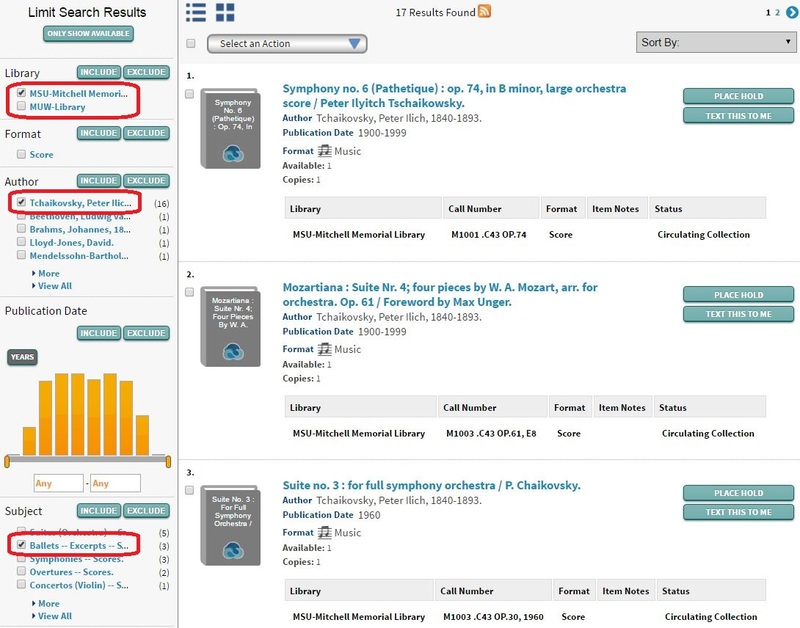 Searching 'piano sonata' without quotation marks will find items in the library that mention 'piano' and 'sonata' anywhere in the title or other part of the library record. Find items with the exact phrase "piano sonata"
On the Advanced Search page, select "subjects" from a search box's dropdown menu. Use keywords in the plural when searching for specific music forms or genres; e.g. "sonatas", not "sonata"
Search subject headings by medium of performance. To do that, enter the plural form of the music genre (e.g. sonatas) and the instrument(s) without parentheses in a "subjects" search box. Mississippi State University Library uses the Library of Congress (LC) Classification System to organize its materials. Click here to see the Full LC Classification Outline for Music. LC call numbers contain letters to indicate the general topic and numbers to provide more specific information about the material. 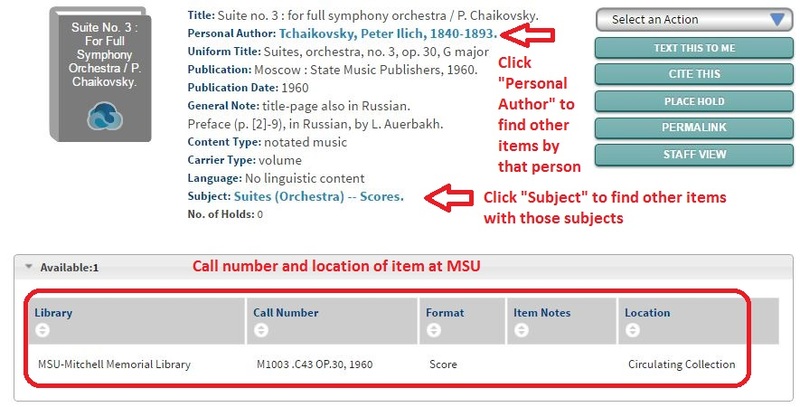 Below is an outline of the LC classification system for music which will help you narrow your search to a particular topic when either browsing the shelves or searching our online catalog by call number range. M 2020-2036 Cantatas, choruses, etc.